Several comments from my last post got me thinking. Most countries have national birds. But why? What do they matter? And which characteristics make for an effective one? The custom is widespread, a heraldic vestige dating back to ancient empires and the once-flourishing practice of coats of arms. Countries as culturally diverse and far away from one another as Finland (the whooper swan), India (the Indian peafowl), and South Africa (the blue crane) give a nod to their avian preferences.1 As previously noted, the bald eagle was declared part of the United States’ official symbol in 1782, back when the country adopted its Great Seal. Not all birds are sanctioned as national representatives; some have become accepted by consensus or through online voting. Such is the case with the United Kingdom’s European robin.2 It holds true as well for the common loon, a traditional but unofficial favorite of Canada. This is why Canadian Geographic’s National Bird Project is conducting an online poll for selecting the top vote-getter from a bevy of avian candidates. Thus far, the common loon is leading. The aim of this project, once complete, is to persuade the Canadian government to act, making the nomination official. Generally speaking, the national bird is a cultural favorite that demonstrates some symbolic significance. The chosen symbol usually connotes a sense of respect, which undoubtedly accounts for the popularity of the eagle, a large bird associated with strength and expansive vision, as well as the ability to soar to great heights. Yet much more seems required for becoming a national bird than mere symbolism alone. The avifauna are native species found throughout many regions of a nation (either during breeding or wintering periods, or both). Their features (and/or cultural relevance) are exceptional or distinctive in some manner (e.g., color, size, song) in relation to other native birds, as well as to other national birds. They inspire special devotion and graphical representation within the national domain. Thus, the first factor explains why the African fish eagle is appropriate for Zambia and the gyrfalcon for Iceland but not vice versa. The second factor provides further justification for why the colorful keel-billed toucan of Belize, the call-carrying bare-throated bellbird of Paraguay, the enormous emu of Australia, and the diminutive kiwi of New Zealand are national birds. And the third factor involves the depiction of these creatures on flags, currency, stamps, and the like. Think of this as the public relations campaign aspect of celebrating a national bird. Those familiar with The Big Bang Theory sit-com, may remember the fictional video podcast series called “Fun with Flags.” For their nerdy online project, hosts Sheldon and his girlfriend Amy regularly shared factoids about vexillology. For those unfamiliar with the term, that’s the study of flags—and, yes, the duo’s stilted conservation was that comically technical. Unfortunately, poor Sheldon suffers from ornithophobia. However, if he and Amy had managed to record a podcast examining birds on national flags, they would have noted that very few include avian images, only about a dozen or so. And, not surprisingly, roughly a third of those display raptors, mostly eagles. Among the most unusual of birds featured on flags are Dominica’s imperial Amazon parrot, Uganda’s grey-crowned crane, and Kiribati’s frigatebird. Interestingly, while the Andean condor is considered the national bird of several South American countries,3 its presence graces only a single national flag, that of Ecuador. The raptor however is among several avifauna depicted simultaneously on both flags and currency, a group that also includes Mexico’s golden eagle4 and Papua New Guinea’s bird-of-paradise.5 By the way, here’s another word worthy of a Sheldon podcast: numismatics. If you were wondering, that’s the term for the study of currency. Of all the national birds, the one that arguably occupies the most prominent status is Guatemala’s resplendent quetzal. Valued for its beautiful feathers, this creature was linked centuries ago to two major Mesoamerican deities, Quetzalcoatl and Quetzalpetlatl.6 In honor of the bird’s historical and cultural significance, the quetzal not only appears today on Guatemala’s flag, banknotes, and coins, but its name has been conferred upon the national monetary system.7 Thus, rather than dollars or pesos, financial transactions are made in quetzals. A lot of countries, of course, display a variety of birds and other animals on their currency. Doing so is a way to increase awareness of native wildlife and encourage conservation.8 Featuring creatures on flags and as national birds, national mammals, national reptiles, etc., is another means of cultivating an appreciation of the many lifeforms and environments in our home countries and abroad. For me, these are the most important reasons for having a national bird or national any-other-creature. Long, A. “National Bird Day – Time to Take Pride in Your Birds,” 1/5/2016. BirdLife International: http://www.birdlife.org/worldwide/news/national-bird-day-time-take-pride-your-birds. Mathiesen, K. “Robin Wins Vote for UK‘s National Bird,” 6/10/2015. The Guardian: https://www.theguardian.com/environment/2015/jun/10/robin-wins-vote-uk-national-bird-britain. Wilkinson, P, Philip, N. Mythology. New York: Metro Books, 2007. pp. 212–213. Bowers, AL, Perez, RC. Birds of the Mayas: A Collection of Mayan Folk Tales. Big Moose, NY: West-of-the-Wind Publications, 1964. p. 5.
International Union for Conservation of Nature. “Voices: 5 Countries Putting All Their Money on Species,” 8/8/2014. National Geographic: http://voices.nationalgeographic.com/2014/08/08/5-countries-putting-all-their-money-on-species/. It’s an odd curiosity of early American history. In a letter to a family member, the coauthor of the Declaration of Independence decides to throw shade at his nation’s new symbol. Why he did this may seem a little perplexing at first. But context is important, especially here. So let’s try to better understand where Benjamin Franklin was coming from in his criticism of the bald eagle. The founding father’s 1784 missive was written only about a year and a half after the United States adopted the bald eagle as part of the country’s Great Seal.1 In a bit of historical trivia, Franklin served on the first of three committees dedicated to creating the design.2 Later, he used the seal while acting as a U.S. ambassador in France.3 However, during his post there is also when he penned that infamous letter to his daughter, Mrs. Sarah Bache. In that piece of overseas correspondence, Franklin declares, “I wish the bald eagle had not been chosen as the representative of our country.”4 Then the Philadelphian sage states three reasons for his objection, two specifically relating to the creature’s “bad moral character” and a third regarding the popularity and pervasiveness of eagles in general. Overall, he asserts (or appears to) that the bald eagle is an unfit symbol for a democratic republic free of monarchic rule and aristocratic ties. For Exhibit A, he accuses the bald eagle of being a lazy cheat, apt to forcing the osprey, by means of harassment, to relinquish its catch. And, indeed, Franklin is right about the raptor’s behavior. Though bald eagles will hunt their own fish, they frequently bully food away from other birds. This is evident in the Grand Prize-winning photo from this year’s Audubon Photography Awards; that stunning picture captures a bald eagle ambushing great blue herons. Thievery, however, is the smallest of problems Franklin has with the bald eagle. Moving on to Exhibit B, he seizes upon what he considers its greatest fault, calling the raptor a “rank coward,” prone to fleeing from “a little king bird, not bigger than a sparrow.” What Franklin meant by “king bird” is not clear,5 but there is some truth in his anecdotal statement. When mobbed by smaller feathered creatures, such as crows and sparrows, many raptors do choose to fly off rather than fight. Bald eagles and other avian predators have little to gain in these situations other than aggravation. Nevertheless, despite being rooted in some truth, Franklin’s description is still quite misleading and incomplete. Bald eagles are generally aggressive birds. As the founding father acknowledges, they confront and hassle ospreys for their fish. Yet he conspicuously fails to mention that bald eagles also will tangle with their own kind. For instance, they are known to engage in bloody territorial battles. In addition, these raptors will assault other large birds. Not long ago, one attacked a Canada goose, the skirmish documented in a series of photographs. Franklin’s last gripe regards eagles by and large, and could be related to the birds’ popularity as heraldic figures. His Exhibit C dismisses the bald eagle simply because eagles in general are “found in all countries.” Though he does not build on this point, what the founding father may be alluding to is the eagle’s extensive history as an emblem of ancient empires and aristocratic cultures. For Franklin, such imperial associations, though involving other species, possibly make the bald eagle—and even the golden eagle for that matter—an inappropriate symbol for a democratic nation. Is There a Better Bird? When dismissing the bald eagle, Ben Franklin looks to another bird, one he considers “much more respectable.” This is the turkey. Despite conceding the fowl “a little vain and silly,” Franklin asserts that it is fearless enough to defend its farmyard from “a grenadier of the British guards.” Sure, a laughable claim for some, but wild turkeys have indeed been known to attack humans, sometimes even going after mailmen and police officers. The domesticated variety aren’t as intimidating, but don’t underestimate them. The gobbler has had its share of fans, John James Audubon being the most high-profile. He used the male wild turkey’s image, along with the motto “America My Country,” for his personal seal.6 Yet, unlike Franklin, Audubon had positive things to say about the bald eagle. In his Birds of America, he describes the raptor as a “noble bird” of “great strength, daring, and cool courage.”7 Why shouldn’t both the wild turkey and the bald eagle, large and formidable creatures found throughout much of the United States, be deserving of respect? The bald eagle/turkey debate unfortunately has long taken on a life of its own. Many people want to choose sides; however, I’d highly recommend not doing so without considering the subject and context of Franklin’s letter. First, he never advocates replacing the bald eagle on the U.S. Great Seal with the turkey. Second, his missive was prompted not by an issue he had with the seal, but by a controversial plan of the Society of the Cincinnati, an American Revolutionary War veterans group. 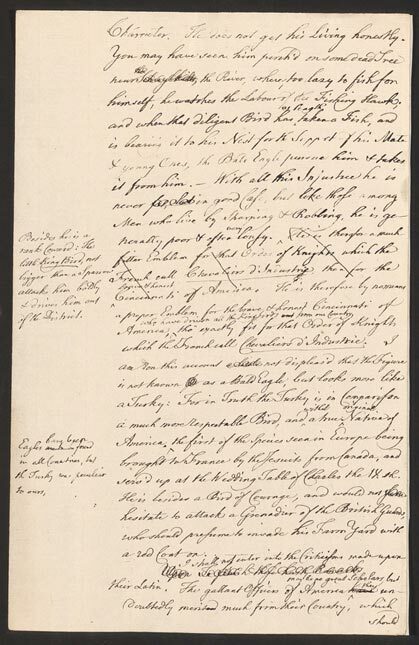 Franklin was concerned that this organization would become, in his words, “an order of hereditary knights.” His letter is devoted to this topic, and the tangents he makes (such as the one involving the bald eagle) are all related to his attack on the organization’s proposal. What specifically provoked Franklin’s ire was the Society of the Cincinnati’s plan “of establishing ranks of nobility” by bequeathing membership and medals to the current members’ descendants. Like the Great Seal, the medals do feature an eagle. Perhaps Franklin would not have even aired his opinions on the bald eagle or the turkey if not for those medals. The reason he appears to bring up the matter at all is to concur with other critics that the group’s design “looks more like a turkey,” something—if you take Franklin’s words at face value—he actually favors. Perhaps, though, he was being facetious. Since Franklin’s letter heavily mingles wit, charm, and wisdom, it is questionable at times whether he is being wholly serious or, in parts, satirical. Consider, too, that he was living an ocean away from his fellow citizens. Isn’t it possible that he may have attempted to stir some controversy over the Great Seal to maximize attention to his letter? After all, he clearly had a much more important matter in mind than avian emblematic figures. Ultimately, let’s not make too much out of Franklin’s commentary on the bald eagle and the turkey. Both are beautiful birds in their own ways and worthy of celebration year-round and during the Fourth of July! U.S. Dept. of State, Bureau of Public Affairs. “The Great Seal of the United States.” Washington, DC: U.S. Dept. of State, 2003. p. 1: http://www.state.gov/documents/organization/27807.pdf. U.S. Dept. of State, Bureau of Public Affairs. p. 2. Anderson, SH. The Most Splendid Carpet. Philadelphia, PA: National Park Service, U.S. Dept. of the Interior, 1978: https://www.nps.gov/parkhistory/online_books/inde/anderson/chap5a.htm. Rising, G. “Benjamin Franklin Talks Turkey” [article includes Franklin’s letter in its entirety]. Nature Watch University at Buffalo: http://www.acsu.buffalo.edu/~insrisg/nature/nw98/franklinturkey.html. The “king bird” and similar epithets (e.g., “regulus” and “little king”) have been used since antiquity to describe wren species. However, a better candidate in this case is the eastern kingbird. Since Franklin is also using the term as a metaphor for the British king, he could have had some other bird in mind. Rhodes, R. John James Audubon: The Making of an American. New York: Alfred A. Knopf, 2004. p. 273. Audubon, JJ. “White-headed Eagle,” The Birds of America. National Audubon Society: http://www.audubon.org/birds-of-america/white-headed-eagle.